To register a new device, you will need the serial number and a Device Name . The serial number is placed on the backside of the logger. During the configuration, you have the possibility to select a pre-configured device profile or to enter manually other values. The standard values are described under the device configuration. In the setting section you can configurate each device the way it fits best for you. If there are any questions during the registration you can just click on the question mark and you will get a decent description. Here you are able to set the needed alarms. You have the possibility to set lower and upper limits. You also can set the alarms with a delay or as cumulative alarms. You can select responsible Users to each device as needed. 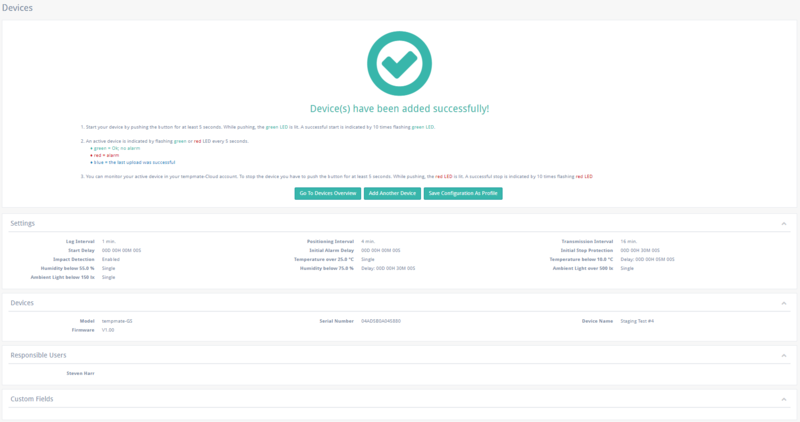 At the end of every device registration you will see this Overview. It shows you every configuration you have made.